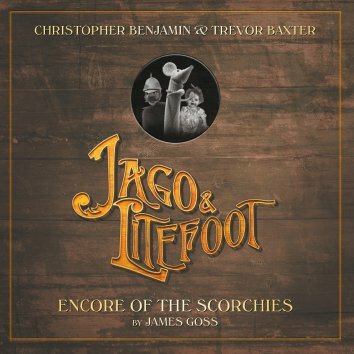 The previous series of Jago & Litefoot ended on a great cliff-hanger – the Scorchies had appeared and were keen to appear in Jago’s theatre, the New Regency (and why wouldn’t they be?!). How would events unfold? What else would befall our favourite Victorian adventurers? James Goss had to write the first story, Encore of the Scorchies, as they are his creation (from The Scorchies). With an idea as mad as the Scorchies in Victorian London the only way is up and we have a massive, musical masterpiece of mayhem and marvel. The plot may have been thin but the entertainment was set at maximum and we enjoy the tale of the threat to turn Jago and others into puppets as the Scorchies. Intriguingly there are several moments when the characters poke through the fourth wall such as when the villains of the piece suggest the story is hard to follow and explain the meaning of sound effects to the listener. Lisa Bowerman is at her most versatile here, not only directing but also singing (though Ellie is off-stage for the middle of the story) and has a revealing song to deliver about wanting a spin-off series (something I did speak to Lisa B about at Big Finish Day 4). In terms of singing the performance of Jenna Russell as Porcelain Polly also takes some beating as it wrings out the emotions of the situation. Suffice it to say the Scorchies are up to no good. Andy Lane gets the second story of the set, The Backwards Men a more straightforward story then the rest though no less entertaining. it is a mixture of aliens and possession and technology that works really well because it focusses on telling a story. There are fewer twists than might be expected and this is to the story’s advantage and the lack of a final (and clichéd) twist is more rewarding than might be expected (if you follow). I find with Big Finish boxsets that story 2 is sometimes less enjoyable than the rest and serves mostly to punctuate the arc – in this case I was pleased that The Backwards Men was a solid piece of Jago & Litefoot goodness. 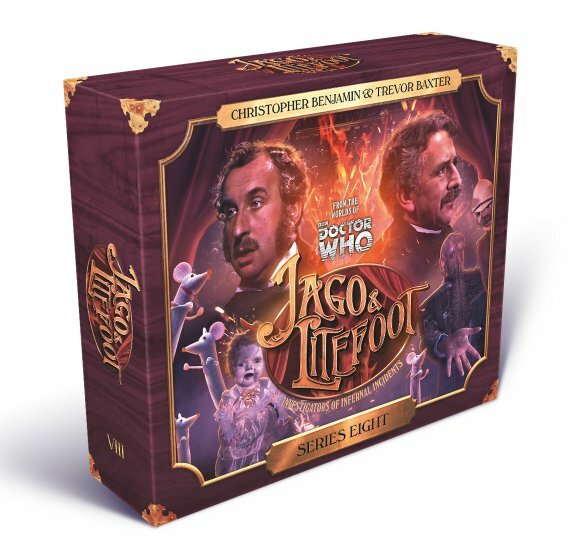 A welcome return for Simon Barnard and Paul Morris (aka bafflgegab) for the third story Jago & Litefoot & Patsy a story of mudlarks (Patsy of the title) that serves as the first in a two part boxset finale. This story explores alien influences and a strange factory that has appears on one of the islands that lie along the Thames. There are vile villains and strange goings-on all of which centre on just what is the factory doing, and what is the strange elixir that is being produced. Flaminia Cinque plays Patsy (the mudlark of the title) with enough excess to paint the image of a woman who has seen better days, but knows how to survive on her own terms. As ever, Justin Richards tidies up the action with Higson and Quick a story whose title tells you most of what you need to know. Following on from events of the previous story, things are not right with Jago and Litefoot and they are acting most out of character. We have yet another possession story and the listener is never surprised though is rewarded with further appearances from Patsy. Ellie Higson teams up with Inspector Quick (the ever reliable Conrad Asquith) to set things right and alls well that ends well. In terms of the set this is the weakest of the four stories though by the standards of Jago & Litefoot that means it is still a well conceived piece of solid entertainment. As ever a great piece of entertainment and still one of the very best things Big Finish produces. I do wonder if the format is getting stale – there are only so many possessions and alien theatricals that can stand up to scrutiny before it slips into formula. The series was freshened up by taking the characters into the TARDIS (though not in-series) and by moving to the 1960s. I am pleased that the next series takes everyone out of London on a well earned cruise – the only puzzle is why would Higson and Quick be on board? Roll on next March!